WordPress for Windows Phone 7 is available now for free in the Windows Mobile Marketplace. Awaiting for this product from Microsoft is over, Communications Server 2010, also called Wave 14 – renamed to Microsoft Lync Server 2010. Microsoft has announced that the new 2010 edition has been released to manufacturing (RTM). The official launch event was on November 17th 2010, so I am sure now that those who have Software assurance, will be downloading now and preparing for the installation/migration. Microsoft Lync Server 2010 communications software offers instant messaging (IM), presence, conferencing, and telephony solutions that can support enterprise-level collaboration requirements. This is only available in 64-bit edition , it requires 64-bit hardware and the 64-bit edition of the Windows Server operating system. Client computers does not required to have 64-bit hardware or software. Client Comparison Tables for the above from Microsoft site, click here. 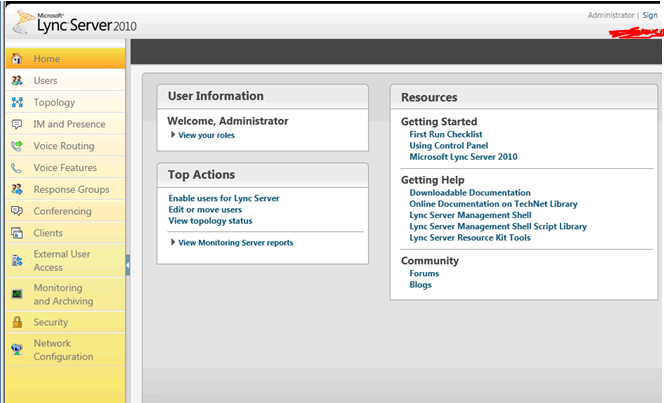 Microsoft Lync 2010 : The default client for Lync Server 2010 meetings. Features include presence, contact management, instant messaging (IM), telephony, and greatly enhanced conferencing. To implement the manager/delegate scenario with Lync 2010, both manager and delegate need to install and use Lync 2010. Microsoft Lync 2010 Attendee : This is a rich conferencing client that allows users without Lync 2010 installed to fully participate in Lync Server 2010 meetings. Lync 2010 Attendee can be installed on a per-user basis, so you can choose to selectively deploy this client, or you can allow users to download and install it as needed. Microsoft Lync Web App : This is a web-based conferencing client that supports most Lync 2010 collaboration and sharing features, in addition to presenter meeting controls and dial-in and dial-out voice conferencing. For users who do not have Lync 2010 installed, you can offer this conferencing option when it isn’t practical or possible to install Lync 2010 Attendee. All of the in-meeting features except computer audio, video, and PowerPoint presentations are available to Lync Web App users. Microsoft Lync 2010 Mobile : This provides IM, enhanced presence, and telephony for users in your organization who are connecting from a smartphone or a phone running a Professional edition of Windows Mobile. Microsoft Lync 2010 Phone Edition : This software that runs on intelligent Internet Protocol (IP) phones (for example, USB-attached phones), and supports placing and receiving calls, enhanced presence, and client audio capabilities for conferences. Microsoft now recently announced that there will be an iPhone client available in addition to Windows Mobile for Microsoft Lync Server 2010. Maybe an Android client will be next!!! Good to hear that. What Lync comes with the new features !!! : There are a lot of enhancements to existing product, on server side definitely there are lot of architectural changes related to Management, Deployment, Bandwidth Resilency and Branch office redundancy mainly for call route., and last but not least Shell command and a basic configuration through web control panel (Commmunications Server Control Panel [CSCP] ). Active Directory for storing Lync server configurtaion has been moved into a new database server Central Management Server which hosts Central Management Store db. in SQL…but some of the info like SIP URI and phone numbers are still in AD. The Lync clients can now be directly updated using windows software update service or windows update. Microsoft Lync Server 2010, Planning Tool Release Candidate..Click here Microsoft Lync Server 2010, Planning Tool, which is available in a 32-bit edition. This is not enough for me..more to come…i will be opening a page dedicated for Lync installation…catch you later..watch my space. Here i mentioned about 20MB attachments to send and receive by the users. The problem here is that, it take a bit time to receive/send because of the high size. So be careful and be patient. If you want to over write this policy to certain users, go to the users mailbox settings, Storage quotas and edit as below. 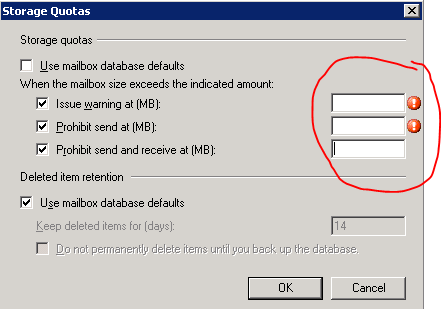 First Uncheck the “Use mailbox database defaults and insert the value as you want. This settings will override the defaults. ‘Flash Drives’ are a generic term which used for anything from USB memory sticks to SSDs. An USB flash drive uses lower quality low performance NAND flash with just 1 or 2 channels. Its durable, cheap but slow. An SSD on the other hand uses high performance NAND with mutliple channels. ( 12 or 8 is not uncommon), and there is a memory controller on a SSD which is much better and both can store data even if its not powered. Flash drives (USB) are slow storage devices where as SSDs are high performance drives. 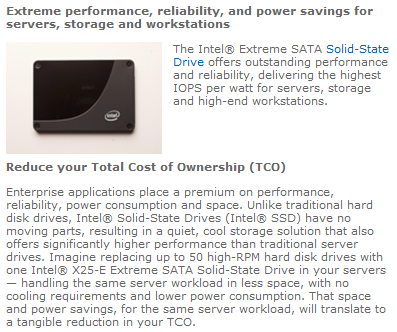 They’re much faster than normal HDDs. A USB flash drive uses USB, which is generally a slower interface than the Serial ATA interface. A USB flash drive is generally thought of as a removable device by the OS and is managed as such. A SSD is treated similarly to a hard drive, and is often recognized by your OS as a type of fixed disk. To download the Exchange Server 2010 Architecture Poster (PDF). For Transport architecture diagrams, see Exchange 2010 Transport Architecture Diagrams Available for Download. MailTips are informative messages displayed to users while they compose a message. 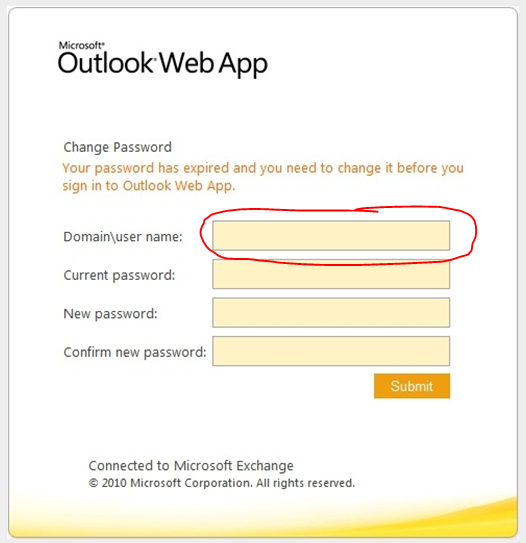 Works with only Exchange server 2010 with Outlook 2007/2010. 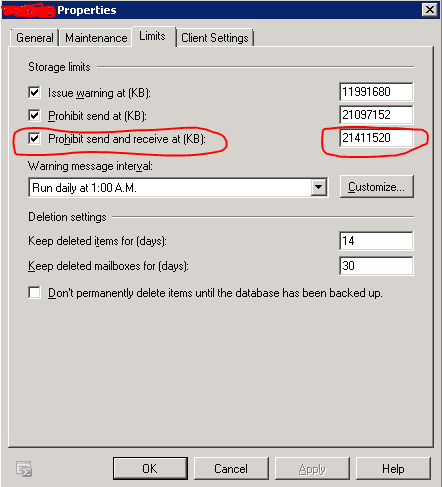 Microsoft Exchange Server 2010 analyzes the message, including the list of recipients to which it’s addressed. If a potential problem is detected, MailTips notify users prior to sending the message. With the help of the information provided by MailTips, senders can adjust the message they are composing to avoid undesirable situations or non-delivery reports (NDRs). EMS : Set-OrganizationConfig cmdlet to enable or disable MailTips in your organization. 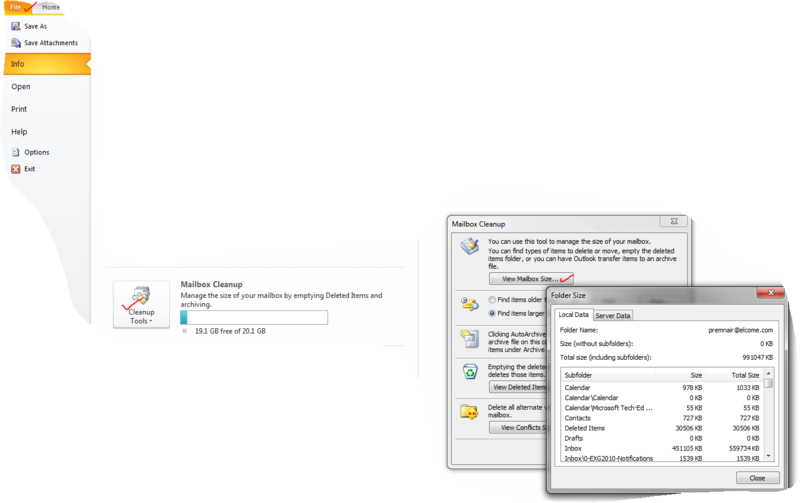 MailTips are enabled by default, when you install a new Exchange 2010 organization. 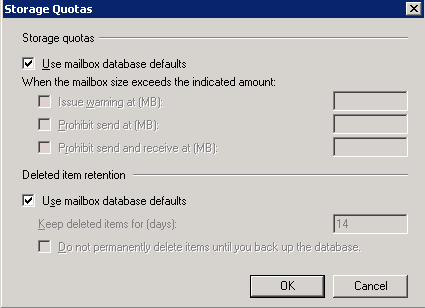 Mail Box full : MailTip is displayed if the sender adds a recipient whose mailbox is full and your organization has implemented a Prohibit Receive restriction for mailboxes over a specified size. MailTip will be updated every two hours in his/her draft folder even if you save it and did’nt send the message.